Brought to you this week by an alien lung bubble covered in pine mulch, be sure to check out the all new episode of Cool Tools of Doom n’ Stuff! By the way, we love our SolidSmack readers! Have something cool you’ve come across and want to share it on SolidSmack? Don’t hide it in your neck skin! Send it on in to [email protected]. Kick it! Hit play on the embedded video below! Hey Joe Coffee Mug – If 24 hour road trips are your thing but you don’t want to replace your beloved specialty coffee grounds with the wonders that are roadside gas station coffee, then consider the Hey Joe coffee mug. Already funded on Kickstarter with nearly three weeks to go, the Hey Joe mug can not only regulate the temperature of your favorite Stumptown blend… but also brew it as well. It’s a hot $49 over on Kickstarter. Sigelock Spartan – The Sigelock Spartan you see at Sigelock.com is a new fire hydrant design that is the result of over 20 years of research, development and prototyping from retired NYC firefighter George Sigelakis. After realizing that existing fire hydrants were both prone to breaking down as well as easy to tamper with, Sigelakis’ Spartan design solves both problems with a more futuristic design. If all goes well with the 150 unit test run across the US, expect to be seeing these around your city. Chrome Cube Lab – If you’re one of the lucky few who can solve a Rubiks Cube in less than 20 seconds, this may not apply to you. For the rest of us, Google has provided us with HOURS of productivity-killing bliss with their Chrome Cube Lab. Users can (attempt) to solve a variety of themed Rubiks Cubes straight from their browser with this Rubik’s Cube-inspired experimental platform. Yep, browse what developers have created or just treat yourself to a few minutes of digital-cube-turnin’ frustration at Chrome.com/cubelab. Pocket – Pocket is the go-to app to save websites for later ‘offline use’ to never read them again. Pocket replaces the need to email yourself links or save browser tabs by syncing your offline pages—including video—across ALL of your devices. This fancy app is free over at iTunes. Chocolate Drone – Chocolate has come in many shapes and forms over the last few hundred years, but this is perhaps the first time we’ve seen a chocolate DRONE! Inventor Mike C over at DIY Drones has shared his build to make a flying piece of chocolate using molds of existing quadcopter parts. Check out the video and prepare to get oddly hungry over at DIYDrones.com. Build-On-Brick Mug – What has three legs, looks like an Ewok and smells like Pizza? Ummmmmmm? …I don’t know? We don’t either! But what we do know is that the Build-On Brick Mug just made our mornings a little more tolerable. This LEGO-inspired mug allows you drink AND BUILD at the same time… making your mornings a little more bearable. Get one for 20 bucks over at ThinkGeek.com. Jyrobike – And finally….learning how to ride a bike is serious business, even WITH training wheels. I still use mine! 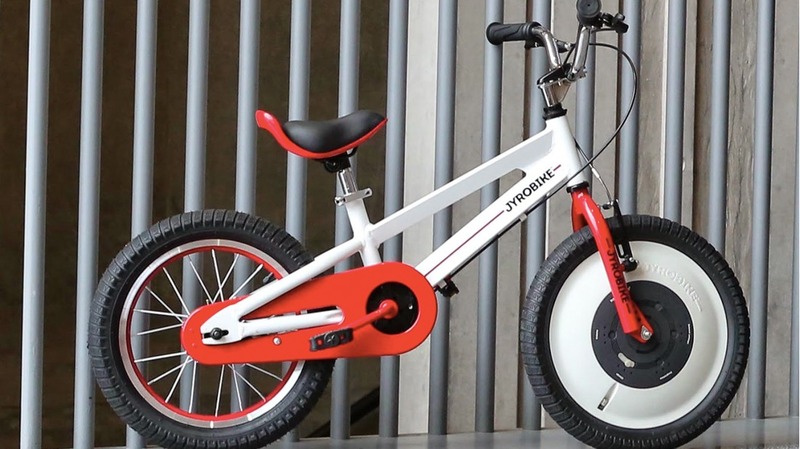 The Jyrobike is a children’s bike that uses a central control hub to auto-balance the bicycle while learning how to ride. Similar to a Segway, the bike allows for a user to focus more on moving forward and less on falling over. You can get an add-on control hub to add to an existing bike for $149 or the complete Jyrobike for $249 over on Kickstarter!